Listed in the National Register of Historic Places, the Rose Island Lighthouse museum (restored circa 1912) is open to the public from 10 AM to 4 PM each day. 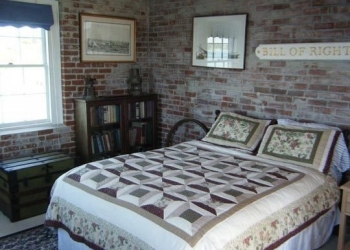 After it closes, the two museum bedrooms on the first floor become available for overnight �keepers� who want to step back in time to experience turn-of-the-century lighthouse life first-hand. 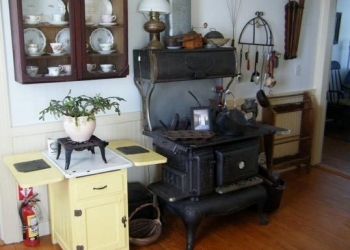 Restored right down to the pitcher pump at the pantry sink, the museum is fully furnished with all the pots, pans, dishes and utensils you�ll need � just as if its keepers of old still lived there. You are responsible for changing your beds and putting the rooms back in order by 10 AM when the museum reopens. Cleaning supplies and fresh linens are provided. Rose Island Lighthouse is located on an 18 acre island off the New England coast, set a mile into Narragansett Bay, Rhode Island. Built in 1869, it is a working lighthouse just minutes away from the quaint colonial town of Newport. Beyond the reach of utility lines and services, the lighthouse stands as an independent, energy-efficient building that was home to keepers and their families for over a hundred years. After the Pell Newport Bridge was built the Light Station was abandoned. For the next 14 years it fell victim to scavengers, vandals and the weather. In 1984 volunteers of the newly formed non profit, the Rose Island Lighthouse Foundation, cleaned out and restored it to its 1912 appearance, installing environmentally sensitive, utilities for electricity, water, sewer, and heat. On August 7, 1993, after the funds had been raised to pay all the restoration bills, the beacon was joyously relit. 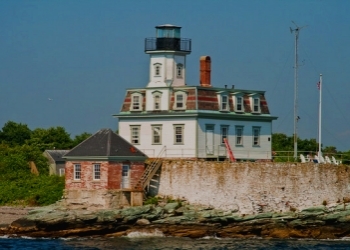 Rose Island Light is once again listed on today's charts as a private aid to navigation. It is one of only a few operating lighthouses maintained by working vacationers who sign on for a week at a time as part of our environmental education program.